If a self-sufficient lifestyle was the only goal for our next project, we could probably make do on a quarter acre of land just about anywhere. What we're really yearning for, however, is a quiet spot in the woods—a place where we can be intimately involved in the rhythms of nature, watching the seasons change as we pursue our passions in relative seclusion among the trees. Should we move closer to the mountains and the ocean, like we've always wanted? We don't have much family outside of the Midwest—would we regret moving away if we left? What if we pick a bad spot? What if it's not "The One"? Is there even such a thing? Why can't we just be guided by a sword like Inigo Montoya in the Princess Bride? How in the world will we find our dream property in a place where the local government just happens to have the relaxed building codes that will probably be required for us to build our home how we please? Will our landscape support solar and wind power? How will we find an area that will remain safe from destructive environmental practices like fracking? How can we be sure that some subdivision isn't eventually going to be built right next door? How can we find a relatively stable part of the country, considering the uncertain environmental times ahead? Should we have multiple generations in mind as we hunt for a homestead? How can we be sure our land won't become inhospitably hot in the next few decades? As our friend, Greta asked: "Would you be happy being the weirdos in the neighborhood, or do need to be around your kind of people?" If we do we decide we want to be in a like-minded community, where will we find it? To make sense of all these daunting quandaries, as well as the vastness of the options available to us in our home country, Tyler had a brilliant idea: we'd get a map, and work by process of elimination. So, we purchased a simple, colorful, two-dollar diagram of the USA from a teacher's supply shop, propped it up against a wall, and got out a big, fat sharpie. If we couldn't figure out where we wanted to live, we could at least begin eliminating places we knew we didn't want to be. 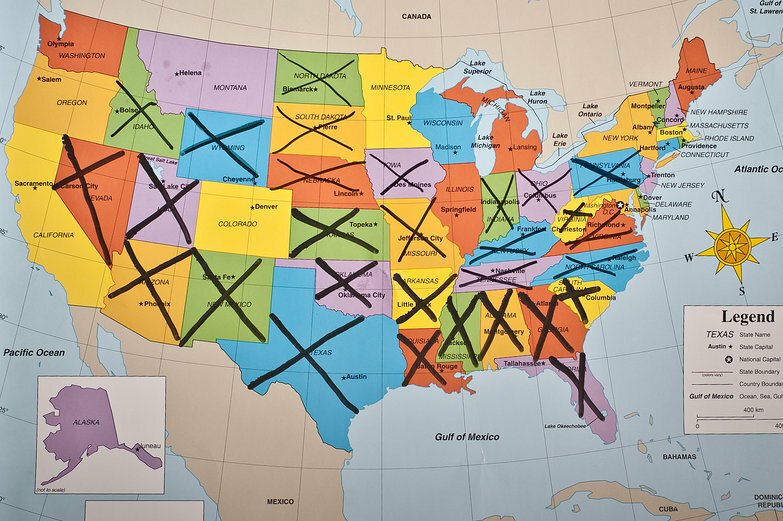 So, we crossed out all of the Southernmost states (too hot), and we X-ed out several states we'd seen on our road trip. It was exciting to visit the "wild west", but it just didn't feel like home. We also eliminated most of the Midwest, save for Minnesota, Wisconsin, Illinois and Michigan. We can't justify moving away from our families and still being in the middle of the US, no closer to mountains or ocean. The act of slashing away at the map with a permanent marker has caused some of our anxiousness to fall away, dwindling in tandem with the number of places left to choose from. Also, we've been comforted by the fact that we already know what it is like to be at the brink of something huge that feels insurmountable. This isn't the first time (and probably won't be the last) that we've pored over maps and planned a daunting, enormous project, breaking it down step by step, all the while feeling like our lives were in a permanent state of complete and total upheaval. We've done it once before—we know we can do it again. Between ten and fifty acres. Equal parts wooded and open space. Water of some kind: a pond? a stream? Within a day's drive of the ocean. Within a day's drive of the mountains. Within an hour or two of a major city. Four distinct seasons. It can't get too hot in the summer, and there has to be a snowy winter. The trees have to look right. No California bays or Colorado spruces—Oaks and maples feel like home. It has to feel right immediately. A nice community of like-minded people in the near vicinity. Lots of local organic farms, farm stands, and farmer's markets! My dad has 19 acres in the countryside and it's big - way more land that you can do anything with really! It does make a nice buffer around you though, making sure that if things change around you, you might not see it from your yard. But it can make it easy for poachers to sneak in during the hunting season... Lakes and ponds can be made (in quite natural ways too, my dad did a great job) and forests can be cut to make more open spaces - but planting a forest is just not worth the try. That's really all I can offer for now! for a discussion about where you can build a little house. Assuming you want vacant land? Consider carefully why it's vacant and if you can really improve it. Love reading about your process of elimination and how you're thinking through everything. Thanks for sharing! Don't forget cost of land and ability to make a living. Both vary widely and are not necessarily correlated. I am astounded by the amount of choice you have in the US! Australia is pretty big but it's mostly empty dessert in the middle. We've only really got two major cities -- Sydney and Melbourne. I'd like to live near a major city too and most of our friends and family are in Melbourne so that's the logical choice. There are only a couple of places really close to Melbourne that I consider nice. So there you go, whittled down to one or two possibilities in an instant. Having said all that, I've seen next to nothing of Australia (something we're going to rectify when we get back), so I don't have 100% confidence in ruling out most of the country. I'm really jealous of your four distinct seasons criteria. That's something I've been really enjoying here in Europe. Pretty much the only seasonal change in Australia -- speaking as a Victorian -- are changes in temperature. If you go further north you get the joy of having a wet season and hurricanes and if you live on top of a mountain you might get snow. I absolutely long to live somewhere it snows in winter, flowers in spring, leaves turn red and golden in autumn and the summers are pleasant without a 40º day in sight. This post hits so close to home. I loved reading it and knowing that we are not alone in how we're going about looking for a place to live. We're two and a half months in to our (year plus?) cross-country road trip while we're looking for a place to live. So many of your methods and criteria are similar to ours. I'm so happy to know that others who have followed this path have found a place to call home! Thanks, Stacey, it's so good to hear that you're finding our process valuable! You absolutely will find a place to call home, and a road trip like yours seems like a fantastic way to discover it. If you come through Vermont, let us know! You're welcome to camp on our land and check out the area. Best of luck to you on your journey!